Ohio borders Pennsylvania, Michigan, Indiana, Kentucky, and West Virginia, and it shares a water border with Ontario, Canada. Western Ohio is mostly flat farmland, with some hills. 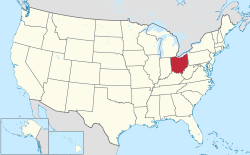 Southern and Southeastern Ohio is near the Appalachian Mountains, and is the most mountainous part of the state. Most of this area is covered by forests. This part of Ohio is home to the Ohio River, the Wayne National Forest, and the Hocking Hills, which has waterfalls and canyons. Central Ohio is mostly rolling hills, and is home to Columbus. Northeast Ohio is dominated by the Lake Erie coast and has a mix of cities and countryside. For many years, industry and manufacturing was the biggest part of Ohio's economy. Youngstown was a big steel producer, as was Cleveland. Other manufacturing - including the car industry - was a major factor across the state. Since the 1970s, industry has shrank in Ohio, but it is still a big part of the local economy. Today, other businesses are more prominent. Cleveland is one of the biggest hubs for Healthcare, and its main hospital, the famous Cleveland Clinic, is the largest employer in the region. Banking is also a major business, and foods and retail are too. Cincinnati is the headquarters of Kroger and Macy's, and Huntington and Key Bank are based in Ohio. ↑ "Ohio's State Motto". Ohio Historical Society. July 1, 2005. Retrieved March 27, 2009. 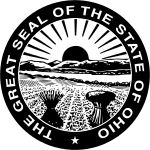 ↑ 2.00 2.01 2.02 2.03 2.04 2.05 2.06 2.07 2.08 2.09 2.10 "Ohio's State Symbols". Ohio Governor's Residence and State Garden. Retrieved March 26, 2009. ↑ "Ohio's State Rock Song". Ohio Historical Society. July 1, 2005. Retrieved March 27, 2009. ↑ "Ohio Quick Facts". Ohio Historical Society. Retrieved March 26, 2009. 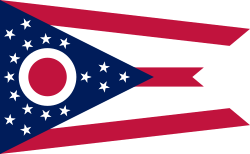 ↑ According to the U.S. Census July 2017 Annual Estimate, Greater Columbus is the largest Metropolitan Statistical Area (MSA) that is entirely within Ohio, with a population of 2,078,725; and Greater Cincinnati is the largest MSA that is at least partially within Ohio, with a population of 2,179,082, approximately 25% of which is in Indiana or Kentucky. Which MSA is the largest in Ohio depends on the context. ↑ 8.0 8.1 "Elevations and Distances in the United States". United States Geological Survey. 2001. Archived from the original on July 22, 2012. Retrieved October 24, 2011. ↑ 9.0 9.1 Elevation adjusted to North American Vertical Datum of 1988. ↑ "Creation of the Board of Elections". Mahoning County Board of Elections. Archived from the original on December 1, 2008. Retrieved March 25, 2009. ↑ "Official USPS Abbreviations". United States Postal Service. 1998. Archived from the original on March 28, 2009. Retrieved March 26, 2009. This page was last changed on 15 March 2019, at 15:02.